Summary from Goodreads: It’s been seven years since the love of Cedar McLeod’s life left with no forwarding address. All she has left of him are heart-wrenching memories of happier times and a beautiful six-year-old daughter, Eden. Then, one day, Eden opens her bedroom door and unwittingly creates a portal that leads to anywhere she imagines. Through the Door was the third (or fourth?) book I've read this year that was based on Celtic lore. Honestly, I wasn't sure if I was going to love yet another book based on the Tuatha Dé Danann, so I had kind of put off reading this one, but I was pleasantly surprised. This book ended up feeling really unique. This book centered around a little girl who was kidnapped after manifesting inhuman powers and her human mother who was desperate to find her - definitely a different take on the Celtic myths than anything I had read before! Secrets. The biggest negative about this book actually started out as a positive for me. There were so many mysteries in this book and I was really intrigued to learn about them all! The problem, for me, was that once Cedar met the people who could tell her the truth, they just wouldn't. Even after Eden had disappeared, none of the Tuatha Dé Danann would give Cedar the information that she needed to truly be able to help her daughter. Even her own mother withheld crucial information that would have made all the difference to Cedar. Because of this, the middle of the book dragged a bit for me, as we were forced to learn about what was happening to Eden in tiny bits and pieces. What started out as a really interesting mystery ended up feeling a bit like a plot device and made me dislike most of the secondary characters (the Tuatha Dé Danann and Cedar's mother). Luckily, I was already invested in Cedar herself and in Eden, so that saved the book for me! Eden. I absolutely adored Eden! I mean, how could I resist a sweet little six-year-old girl? The entire beginning of the book where Eden discovers her power was just magical for me and I really enjoyed it. Every scene with Eden was a good one and I hope we get to see much more of her in the next book! Cedar. I really felt for Cedar - her sense of pain and loss when Finn left her was palpable and I thought that it was incredibly realistic that her pain filtered into her relationship with her daughter on some level (which isn't to say that her relationship with Eden wasn't good, but there was always a slight sense of loss for Cedar that she couldn't overcome). I felt her sadness and desperation even more keenly when her daughter was taken for her and I loved that she put her daughter first - always! Cedar wasn't always strong, but she was when it came to her daughter and her ultimate desire was always to do what was best for her (even though she didn't always know what the best answers were!). Finn. I was definitely a fan of Finn and was rooting for Finn and Cedar to reconcile. He seemed to be the only Tuatha De Danaan who actually had Cedar and Eden's best interests at heart. From the very first scene, I was in love with Finn! Celtic lore. McIsaac did an excellent job of weaving the Celtic mythology into her story without making it confusing (which can be hard to do). While she relied on the lore, she didn't use too many foreign terms or rely so heavily on the mythology that it would need to be explained in detail, confusing the story. I thought that this was a great balance! 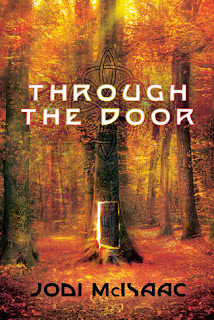 Through the Door is an enjoyable paranormal novel that led us on an adventure in the land of Tír na nÓg! I definitely recommend it to fans of paranormal romance and mythology! I'm eager to read the next installment in the series to find out what will happen next! 4/5 stars.